5 Quick Video Tips In 15 Seconds Or Less! At 12 Stars Media we share fun and informative short video production tips on Instagram, but we decided to put several together into a collection for you and dig a little deeper into each one. Hope you enjoy! It’s always important to watch those little bars we call audio levels when recording video. You never want to have audio that’s hard to understand or that’s so loud it’s going to cause your audience to cover their ears. So keep your audio levels between -12 -6b for happy clean audio. While keeping things in focus consistently isn’t a bad thing, we recommend switching it up by using manual focus instead of shooting in auto focus. This will give your shots that extra boost of creativity when your subject matter is slowly brought into focus, which essentially reveals that subject matter to your audience. Before taking your gear on a shoot, make sure you test it out and become familiar with how it works, because nothing is worse than making a fellow team member or client wait around while you figure out how to use your shiny new gear. This tip also saves you from looking like an amateur. Sometimes, when zooming in your video can turn out a little shaky or even make your audience a little nauseated, especially if you’re zooming in too fast. By choosing the dolly over zooming in, you’re giving your audience that sense of realness that comes with actually moving into a scene rather than zooming in. This also makes for a clean and smooth shot. So, go with the flow and choose the dolly. When using a lavalier mic, make sure there’s not going to be anything on or near whoever is wearing the mic, because that could potentially cause a distraction in your audio. So, if your subject matter is wearing a necklace, has buttons on their shirt, or even has long hair, be aware that these things could rub up against the mic causing unwanted noises. By knowing these potential dangers beforehand, you can help save your audio (and who wouldn’t want that?). For more helpful tips, be sure to check us out on Instagram! 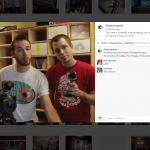 This article was syndicated from Business 2 Community: 5 Quick Video Tips In 15 Seconds Or Less!